NaNoWriMo is taking up a lot of my writing time and energy (writing a novel takes a lot of effort. Who knew?) So this is a bit late, and a bit brief. My apologies. 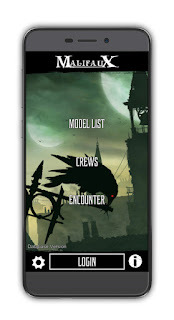 -Obviously, the biggest news of the last week was the launch of the Malifaux app. If you haven’t gotten a chance to check it out yet, you should probably go download it here. I’ll be taking a look at it in more detail below. -There’s 2 days(ish) left on the Iron Painter. Good luck to everybody who is competing. -The last several Malifaux Monday Preview articles have been showcasing pursuits coming with the next Through the Breach sourcebook, Above the Law. This book details the Guild and its various iterations. So far, we’ve seen the Marksman, Commander, Magewright, and Bureaucrat. One assumes we’ll see some of the various members of the Special Divisions detailed therein, perhaps akin to the Death Marshall Advanced Pursuit from the Core Rules. The new app for Malifaux launched this week for Android and iOS. The app allows players to build crews, track their collection, and set-up and run games all from their phone. Furthermore, for only $10, players gain access to the full stat cards of everything in Malifaux, from now to perpetuity. You read that right: you aren’t going to have to pay $5 for every new expansion book that comes out. A one-time payment gives your Google or iTunes account lifetime access to every Malifaux model’s stat cards. That seems like a great freaking deal. I honestly expected it to be much higher and work like so many other fremium apps, with micro-transactions from here to the end of the game’s lifespan every time something new comes along. Plus, this prevents the need for constantly reprinting stat cards from Wargames Vault every time an errata comes out, which is a welcome change for many players, especially those who have to pay to have their new cards to be shipped overseas. So far, crew construction is easy enough to understand, though replacing one set of muscle-memories from the old app to with the gestures for the new one is taking some time (I keep double tapping models to add upgrades to them, which of course deletes them.) Most of the hiccups experienced so far involve oddities of crew construction, as would normally be expected. For whatever reason, I can put Warped Reality on Changelings right now but not Bultungins. That kind of thing is to be expected, and I would expect that they’ll be corrected over time (though expect to have more hiccups from every new book.) And as I said, access to all the stat cards is a huge advantage. It’ll be nice not to have to scroll through a pdf or dig out a book every time I want to look up an interaction. Plus, when I’m testing something new on Vassal I won’t have to drag books around with me. Of course, the hotly debated topic right now is whether the app can replace bringing cards to games. People go back and forth on this one. Personally, I think I’ll still bring the cards as long as I own them. I don’t like having to flip between pages on my phone while I’m playing the game, especially while mine is having to chug a bit to load everything. That’s one of the main concerns for tournaments, effect on speed of play. The other is the possibility of player misconduct. If your phone is not visible to the other person, there’s nothing stopping you from changing something mid-game to protect yourself other than your own honesty. That’s unacceptable for some people, and inevitably some jerk would get caught cheating in a major tournament if the concern isn’t addressed. It would be technically quite a bit more challenging than what’s currently available, but the only way to really address this would be to have the game records update live between people’s devices. Personally, I don’t mind using it on my own during games to keep track of things, but I can see where some people wouldn’t be alright with it. So, the debate is ongoing. Overall, I think the app is a great start. It’s visually quite good. $10 for lifetime access to the stat cards is a surprisingly good deal. Most of the crew construction works find, and the kinks can be ironed out over time. I think it’s well worth a download.